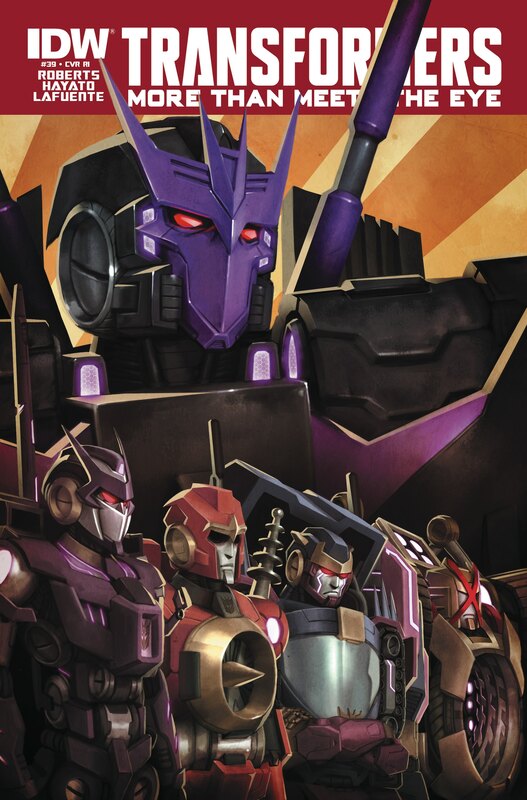 This week we talk IDW editorial, third-party accessories, and whatever else comes to mind! 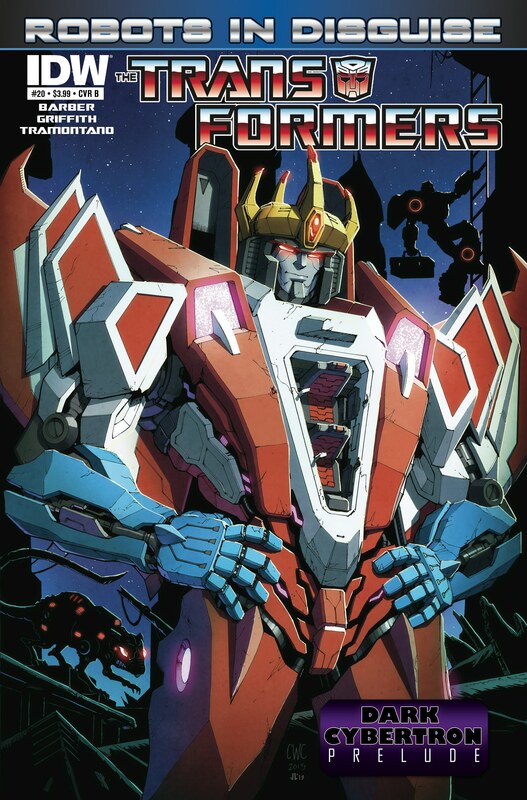 Now that Dark Cybertron is well and underway, we here at Iacon Underground were fortunate enough to get to ask IDW writers John Barber and James Roberts some questions about the series so far and both Robots in Disguise and More Than Meets The Eye going forward! IU: Thank you both so much for taking the time to talk to us! 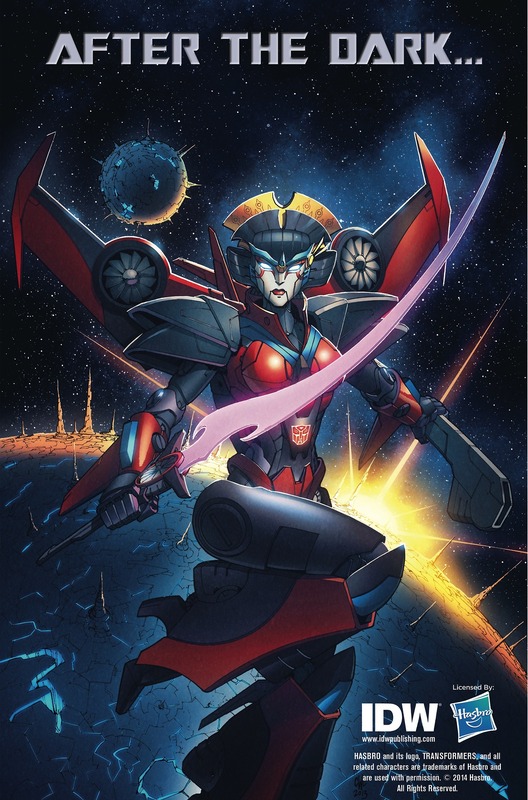 Now that we’re halfway into the event, what’s your favorite part of DARK CYBERTRON so far? What upcoming part of the series are you looking forward to finally seeing the light of day? John: Well, we’re a little past halfway, but that’s my fault for not writing this quicker… it’s funny, because of the way this comic came together, that so much of it kinda crushes together in my head… it’s hard to remember what’s out, what’s done but not out, and what’s still in progress… Early on, I think the combination of Phil Jimenez and Andrew Griffith in issue 1 was really exciting to see. I’ve known Phil a little bit for a while, but never actually worked with him or even spent any real time talking to him before we started this comic—and it turned out we grew up really close by each other. And Andrew, I love working with. That first issue coming together was really cool. As far as looking ahead—I think the last act of the story, the last third is really strong. Issue 9 is really crazy action, and I think James and I found a good rhythm to the writing there. And issue 10 is a lot of fun, there’s sort of a breath to take, before the end comes. 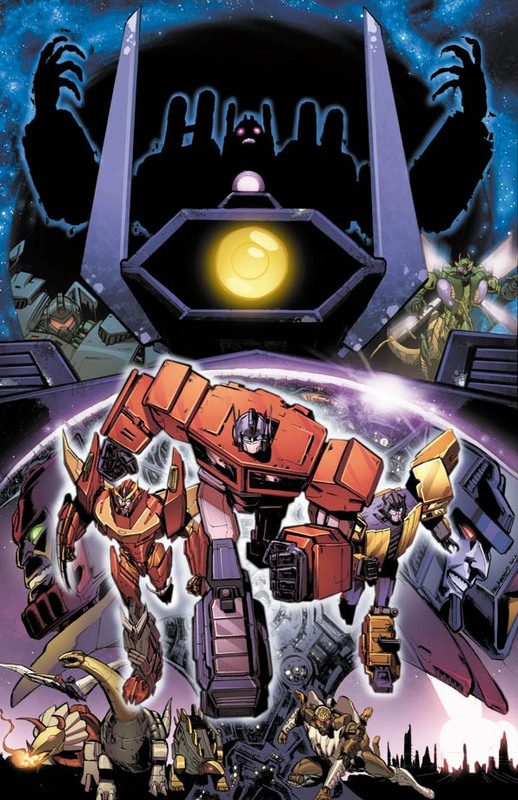 Over on their Tumblr, IDW’s been tossing out teaser images for what comes after Dark Cybertron with the “After The Dark…” tagline. 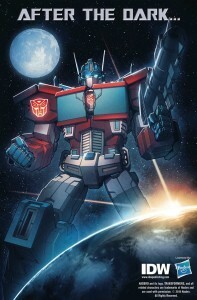 The first one, with Optimus Prime (or possibly still Orion Pax?) over a planet that looks suspiciously like Earth, was a bit of a surprise after IDW swore off Earth-based stories a couple years back. The second, with Windblade and Cybertron, surprised no one (but was nice to see!). 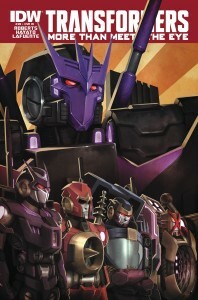 It’s the third one that’s the real shocker, not so much for the character it features – Megatron – but for the details. Yep, that’s an Autobot symbol on Megatron’s chest, and his associated setting? The Lost Light. At NYCC13, IDW announced a new Transformers/G. 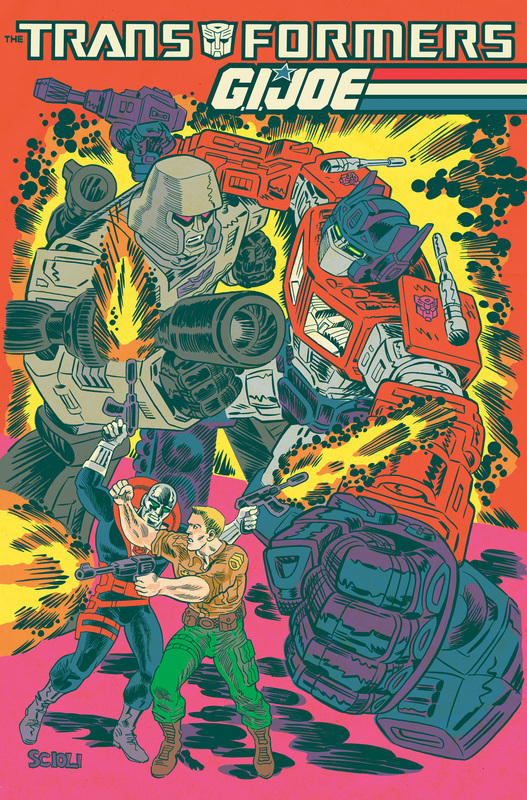 I. Joe crossover to be drawn and co-written (with John Barber) by Tom Scioli. 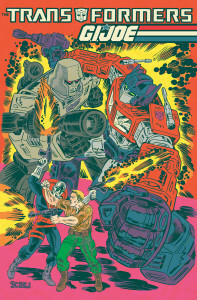 There have been enough crossovers between Hasbro’s big 80s “boys” franchises that yet another one would really have to bring something new to the table, but Scioli, known for his heavily Jack Kirby-inspired art on Image’s Gødland and his own webcomic American Barbarian, looks like it definitely has something new to say. You can check out the full story-so-far over on ComicsAlliance. With his “friend” Metalhawk dead at his feet and all Cybertronians who refused to renounce their prior allegiances exiled to the dangerous wilderness outside of the city, Starscream finally got what he wanted – control of Iacon, the last bit of civilization on Cybertron. 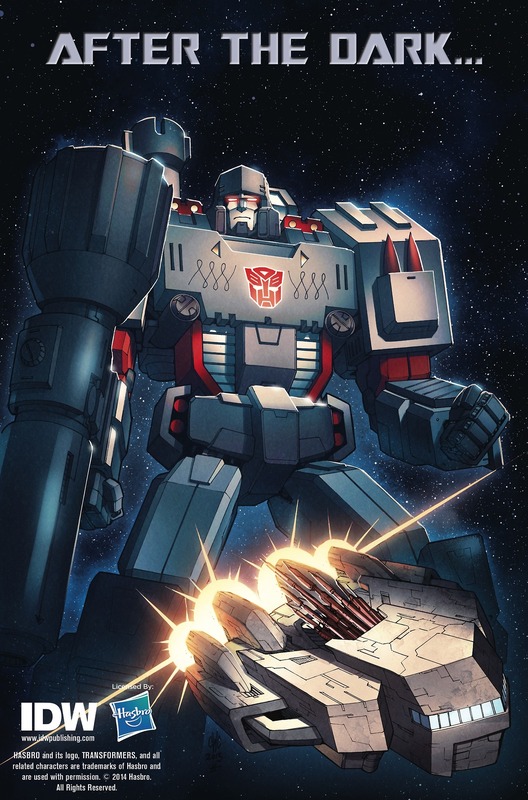 But even in peacetime being leader isn’t easy, and Megatron’s Most Troublesome Lieutenant soon has infrastructure failures, treacherous hangers-on, and worst of all, the media to deal with, all in the course of one long night.